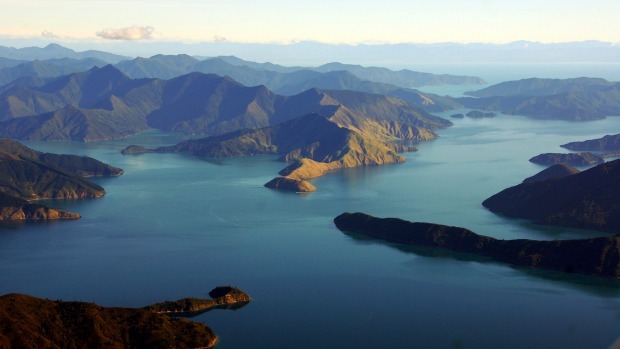 Maori legend holds that the long arms of the Marlborough Sounds were created when the warrior god Kupe fought a giant octopus. A New Zealand fur seal leaps out of the water alongside our catamaran with an octopus in its jaws and the tentacles wrapped around its head. The seal whips its head back and forth then flings the octopus into the air, keeping just one tentacle between its teeth then sucking it up like a strand of pasta. Whoosh! The seal is off again, lunging after the octopus now drifting inertly on the surface. The seal snaps it up, snips off another tentacle, and swallows. The encounter is a dramatic coda to a gentle early-morning walk in the Motuara Island wildlife sanctuary at the end of Queen Charlotte Sound, one of the spectacular Marlborough Sounds on the north-east coast of New Zealand's South Island. The clash between seal and octopus is an appropriate welcome. Maori legend holds that the long arms of the sounds were created when the warrior god Kupe fought a giant octopus. During the battle, the octopus grasped at the land with its tentacles, gouging out this exquisite labyrinth of peninsulas and islands. That seems far more credible than claims that the sounds are no more than an accident of nature, created when ancient valleys were flooded by the Pacific. Two pods of dolphins had shimmered past our boat on the cruise from the port town of Picton along Queen Charlotte Sound to Motuara. The wildlife sanctuary's famed colony of little blue penguins was out fishing, leaving a welcoming party of inquisitive South Island robins, endangered saddleback wattlebirds and yellow-crowned kakariki, their brilliant green plumage an invisibility cloak among bright foliage. It proves an easy walk to the top of the island for a panoramic view back down the sound and past Picton to snow retreating from the peaks of the Kaikoura Ranges. We grab another catamaran for the short hop from the island to Ship Cove on the west coast of the sound, where we are greeted by Kupe himself – in the form of a towering Maori carving of him triumphing over the octopus. The rest of our party heads out along the Queen Charlotte Track, but we skip ahead (via catamaran) to Resolution Bay where we'll meet up with them again in a couple of hours. The track's full 70 kilometres is a four-day walk, or even five if you take a break in the middle. We've opted for a "day trip" of 5½ hours but – unsure of our fitness – trimmed it to just 3½ hours. Our good-humoured guide, Alex Roberts from Wilderness Guides, is a master of bushcraft who can tell you which leaf is best for toothache, which for sweetening your breath, and even which for wiping your behind. Happily we don't need to put the last to the test. We've lucked on a sunny day under clear skies, and the Queen Charlotte Sound shines every bit as brightly as it does in the travel brochures. Spectacular views of high ridges and sheltering bays explode unexpectedly though sudden gaps in the bush along the track. When the strong sunlight hits the sandy shallows, the bays are green-lipped like the local mussels. The track is wide, generally even, and firm underfoot. Frankly, our hike is more of a stroll, and our walking poles look needlessly melodramatic, as we climb just 220 metres to the Tawa Saddle then ease down to the Endeavour Inlet and along to Furneaux Lodge and the catamaran back to Picton. The next day brings a revelation: Cloudy Bay is not just a brand of wine but a real place, an impressive stretch of water south east of the Marlborough Sounds. It was named in 1770 by one Captain James Cook, a British navigator who seemed to spend a lot time holidaying in this part of New Zealand while London thought he was busy exploring the east coast of Australia. Behind Cloudy Bay is a big lagoon – imaginatively named the Big Lagoon – fed by two rivers, the Wairau and Opawa. Our morning of kayaking on the Opawa begins well enough: terns wheel above us looking for whitebait, while a white- faced heron watches us quizzically from the river bank. But a persistent headwind soon has us paddling back to base where our Driftwood Eco-Tours guide, Will Parsons, cooks fresh Cloudy Bay cockles in white wine sauce to be chased down with a local pinot gris. Will, an encyclopaedia of Marlborough history and wildlife, insists we can't go home without seeing what we've missed, and drives us to the top of a hill with sweeping views across the Wairau River wetlands, the Big Lagoon and the silvery expanse of Cloudy Bay. The next day, the water turns to wine; we're at the other Cloudy Bay where the tasting ranges from the powerful 2014 Te Wahi pinot noir to the delicately fragrant 2013 Te Koko sauvignon blanc. After hiking and (truncated) kayaking, we're more than ready to relax in the back of the BMW as our private winery tour whisks us up to the Brancott Estate restaurant high on a hillside. The view threatens to upstage even the exceptionally good food and wine. The neat rows of Marlborough vineyards merge into a vast swathe of bright green corduroy billowing towards a distant sliver of sea. Our guide and chauffeuse Fay Silcock, from Marlborough Elite Tours, is glancing at her watch. Time to head to the Omaka Aviation Heritage Centre where the internationally famous collection of World War I aircraft and memorabilia has recently expanded into World War II, with the centre's Dangerous Skies exhibition. At last, those magnificent men in their flying machines have been joined by a woman, Russian air ace Lydia Litvyak, the "White Lily of Stalingrad", who shot down three German aircraft in the skies above the besieged city. As clouds of orange flame barrel towards us from a widescreen re-creation of the siege, we escape out the door and up the path to the nearby Omaka Classic Cars Collection which begins around the 1980s and looks back nostalgically to the 1950s, a decade of heavily chromed, walnut-veneered luxury, with chauffeurs in the front seat and cocktail cabinets in the back. Our three days were just a tasting of Marlborough. Next visit we'll stay long enough to drain the bottle. Air New Zealand flies to Blenheim in the Marlborough region from Wellington, Auckland, and Christchurch. There are also several ferry services each day from Wellington to Picton and return. Greg Lenthen was a guest of the Marlborough Lodge and local tour operators.